This one pot Smoky Jambalaya is great for any get together when you are looking for easy, tasty, and meal that’s not fussy. 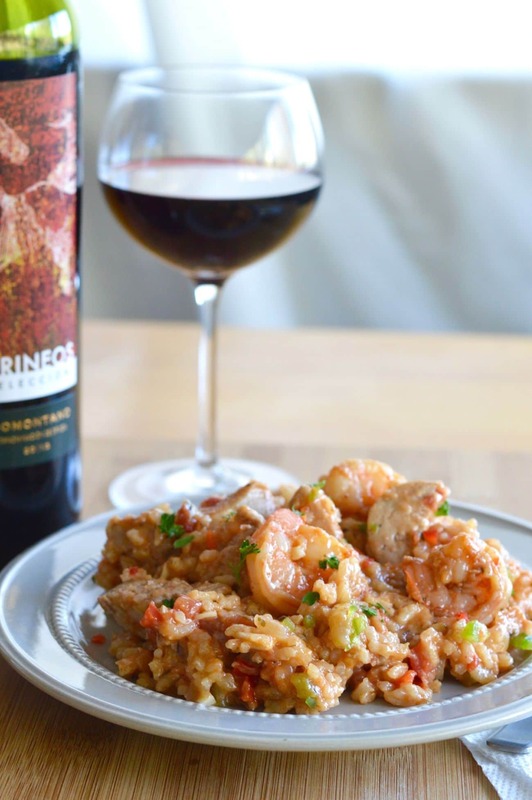 It’s full of flavor and pairs well with any Garnacha wine. This recipe for One Pot Smoky Jambalaya is one of our fall favorites. I especially like it because I can serve it to company and the meal seems impressive, but its so easy to make. I was lucky to get some wines from Wines of Garnacha to find a recipe that pairs well with their wines. While this post was sponsored by them, all opinions and comments expressed here are my own. My husband has been a fan of Garnacha Wines for a long time so I can’t tell you how excited I was when I found out I was going to work with them. Wines of Garnacha uses a garnacha grape from vines originally sourced in Eastern Spain. Long used as a grape in blends for wineries all over the world they are now becoming very popular as the primary grape and being marketed as Wines of Garnacha. The wines arrived just in time to have for International Garnacha day which is September 16th! 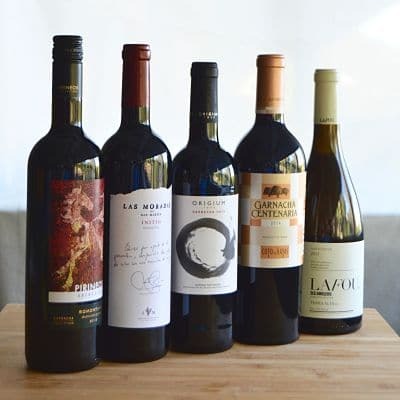 Garnacha Wines are very popular because they have so many different wines available to choose from (both red and white varietals) so you’re able easily find something to pair with any meal. We’ve been drinking them for a couple of years because they’re so reasonably priced. ($10-$20) These are the wines that I received to use to pair with my recipe One Pot Smoky Jambalaya! 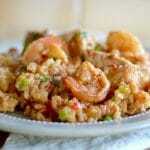 Jambalaya is a rice dish from Creole origins. I had it the first time at Emeril Lagasse’s restaurant. I made his recipe for a long time and this was inspired by recipes that Ive used from him over the years. You can use store-bought creole seasoning, but I’ve have a homemade cajun seasoning mix that I use in this for a creole seasoning. The rice is cooked right in pot with the meats and it just screams comfort food. Easy/Hard: Medium. Not that it is difficult to make, but there’s a lot of chopping involved. My suggestion is to get everything ready before you even start cooking, it makes the rest of the cooking much easier. Make Ahead: YES! Make this the day before you need it! It heats up really easily! It also freezes beautifully. Just let it defrost completely before reheating! PAIRING: Any wine made with Granacha Grapes! This one pot Smoky Jambalaya is great for any get together when you are looking for easy, tasty, and not a fussy meal. It's full of flavor and pairs well with any Granacha wine. Heat a large stock pot to high, then swirl 3 tablespoons of oil into pot to cover bottom. Once oil is hot, add onions, peppers, celery and cook for 5 minutes. Add garlic, entire can of tomatoes(including juice) bayleaves Tabasco and worcestershire sauce. Cook for minutes then add rice in and stir to combine. Slowly add chicken broth and cook rice for 15 minutes. Then add shrimp, chicken and sausage and cook until meat is cooked through. About 10 minutes. Sprinkle with Garnish of Fresh parsley. Serve with Tabasco sauce for those who desire a little added heat. The smokiness worked so well. Thanks for a great recipe. This recipe was flavorful, healthy and so easy. Loved it. And it makes a lot so you have plenty of left overs or meals to go in the freezer. 2 thumbs up on this one. Im so glad Jodee~~ I love the freezer meals that are available at a moments notice too! 🙂 ~m ps… if you like this, you will love the paella recipe I have coming next week! I make etoufee often, but now want to have a go at Jambalaya. This looks So good! This dish is just gorgeous and would be perfect with a nice glass of wine. Great photography and those seasoning sounds good. I love recipes that can be made in advance and this sounds like perfect comfort food, especially as the weather is beginning to turn a little colder here. The busier we get the more I like make ahead recipes…. they make life so much easier! 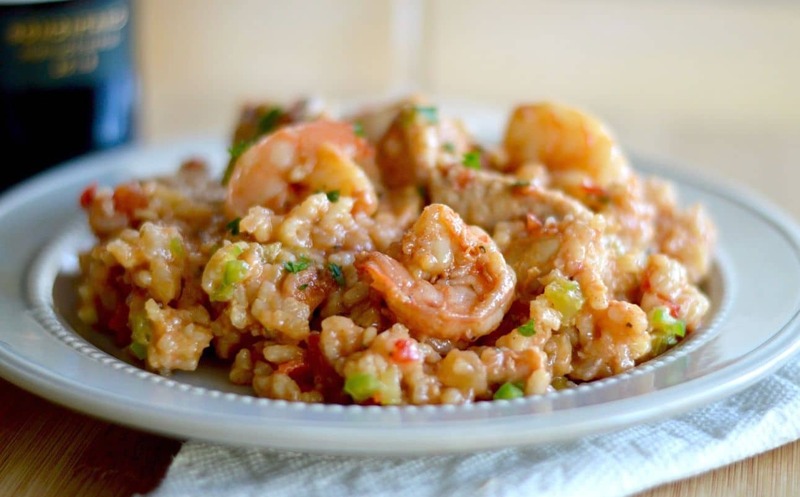 I think I ate my weight in jambalaya through university – my roommates and I made it often. Perfect meal for a crowd! Yours looks mouthwatering!! Wonderful looking plate of jambalaya! Eating at Emeril’s restaurant must have been a great experience! Ohhh I’ve been wanting to make Jambalaya at home for ages! Somehow I thought it was more difficult and time consuming, but your recipe look so easy to follow. Will give it a try!